What do we celebrate today? That’s right, Fathers’ Day. So dear and warm a celebration. I believe this is really fitting a time to reflect on the gift of fatherhood. We’ll do two things. We’ll reflect on the state of fatherhood today, and on what should be our way ahead. We live in this ever shrinking and ever-changing world. What happens somewhere else has greater and greater impact on us as well. Ideas have consequences. There are ideas that have shaped and changed our society and have led to the situation where our society is right now. One of these bold and foolish ideas, is the idea that there is no God Creator, that there is no such thing as God’s design for humanity, for marriages and families, and for our flourishing. Instead there is just an ongoing evolution and we ourselves can determine how things ought to be. Essentially, we have declared ourselves to be gods. People in all ages and all places have always tried to understand how this world works, to discover principles built in the very fabric of creation. To know these principles, and to live accordingly was considered true wisdom. Today, instead of trying to understand the wisdom of the Creator, we want to bend reality according to our ideas and desires. Where has it lead us? You tell me. Wealthy and prosperous Western countries are pioneers in their rebellion against God and reality, and they suffer the most from unhealthy relationships, divorce, fatherlessness, depressions, anxiety, etc. Not to mention that they are literary dying out. For there is no future for nations with 1.1 or 1.3 children per family. Ideas have consequences. The sweet idea that we don’t need God and can take His place, is gradually revealing its bitter aftertaste. If there is no God the Creator, if there is no His design for our lives, then we can to whatever we want. This is, what we have been busy doing. Except, what we want usually is not what we need and what is good for us. Today is Fathers’ Day. Wonderful celebration. But before we talk about fathers, we need to talk about … husbands. And before we talk about husbands, we need to talk about … sons. These all are connected. There is no one without other. First sons, then husbands, then fathers. Let’s be honest, our society has messed up all three of these. Our society has lost the wisdom when it comes to what it means to be a father, a husband, a son. We don’t know anymore how to raise sons, or what it means to be a son. For the last 50 years we have been told that there are no differences between boys and girls, men and women. That all differences are simply our inventions. To be precise, the evil patriarchy (whatever it is) has invented them, to oppress girls and women. And our society has spent this last half a century trying to erase all these differences. They have succeeded to great extent. They don’t raise boys anymore to be adventurous, competitive, courageous, breadwinners, brave protectors and loving heads of their families. That’s offensive. If someone still does that, they probably are backward, haters of women, etc. Our society doesn’t raise sons, and doesn’t raise husbands anymore. For how would you raise husbands if there is no difference between men and women? So, they don’t. They raise … what was the word? Yes, they raise partners. They raise men who don’t want to take responsibility, who don’t want to make commitment, who prefer to sacrifice others, instead of sacrificing themselves for their wives and families. And we can’t blame those men too much either. For the whole society have screamed against men being men. Instead we need women to be like men. Now we have this vicious circle. Men can’t be like men, and they are unhappy. Women don’t like feminine men, so they are unhappy too. But there is not much else left. We have brought this misery upon ourselves. Ideas have consequences. When we try to take God’s place, this is what happens. We don’t know how to raise sons, we don’t have good husbands and we don’t have good fathers. But there are so much research available that shows the importance of fathers. Boys without fathers often end up in jail. Girls without fathers continue searching for men’s approval, and often end up living promiscuous lifestyles. 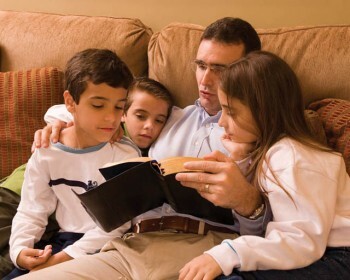 Children whose fathers don’t teach them faith, most likely will end up unbelievers, even if their mothers pour their hearts out teaching them about Jesus. This is reality. These are facts. And there are many more of them. You see, when we talk about all these issues, today, on Fathers’ Day, we are basically talking about one of God’s commandments. Do you know which one? That’s right, the 4th commandment. The 4th commandments protects family, parenthood, children and God’s design and wisdom for our flourishing. If you live according to the Creators design and wisdom, if you know what it means to be a son or a daughter, a husband or a wife, a father or a mother, then you will have a long and blessed life in your land. And the opposite is true as well. If you imagine that you can ignore God’s design for your life and make reality bend according your whims, there will be disorder, insecurity, disappointment, sadness and brokenness all the days of your life. We see too much of it in our society. Ideas have consequences. False and foolish ideas lead to misery, and we have plenty of it. True and wise ideas lead to well-being and prosperity. So, what should we do? What is our way ahead? We as Christians have something truly precious in our possession. We have God’s wisdom revealed and entrusted to us, to shine its light in this confused world. We have even more, we have examples, we have standards given for us, that reveal what it means to be a son, a husband and a father. Our God has revealed it to us. Jesus Christ was the most perfect Son to His Father. Honouring His Father, learning from Him, living to bring joy to His Father, perfectly obedient to the Father’s will, even till death. And because of His obedience the Father could bless Him abundantly. Everything that the Father had, was given to the Son. Thus, Jesus is our perfect example for what it means to be a son. But, we are not perfect. We have failed so many times as sons and daughters to our parents. Too often we have hurt them. Too often we have been too proud to ask for forgiveness. So, what does it help if we have this perfect example, Jesus? It helps. For He is much more than our example. He is not only the perfect Son, He is also our perfect Saviour. He has taken all our failings to be good sons and daughters upon Himself, and in exchange He gives us His perfection. He has made us His brothers and sisters, with all our imperfections. Now, through Jesus, we too are made perfect children of God the Father, heirs of everything that the Father has given to Jesus. His perfection was enough for us all. Now, what about husbands? Jesus reveals and teaches what it means to be a husband according to God’s design. Throughout the Bible He is called the Bridegroom, and the Church, all of us, are called the Bride. It is in these relationships where Jesus shows what God’s will for all husbands is. He sets the bar for all husbands. We are to love our wives more than ourselves, and are to be ready to lay down even our lives for our wives. Who wouldn’t want a husband like that? Unfortunately, we all fall short. We don’t live up to Jesus’ example. So often we are selfish, too often we misuse this wonderful calling entrusted to us, too often we care more about our own desires, than we do about our wives and families. We all need to repent. But, again, there is a hope for us. Jesus, the perfect husband, is not only our example, He is also our Bridegroom, we all, all Christians, are His Bride. And Jesus has laid down His life, so that He could make His Bride, us, holy. He cleanses us from all our sins, and prepares us for our Great Wedding feast which awaits all God’s people. This is where we are heading. To consummate this marriage with our Bridegroom, and to enjoy His love and care forever. Finally, let’s talk about fathers. Ideas have consequences. As we discussed, we have tried to live according to our ideas, and this is where it has led us. Or we could once again search for the true wisdom, looking for guidelines to the One, whom we all call our Father in Heaven. He is the One, from whom all earthly fathers get their name. He is the One who reveals what it means to be a father. He is our Father, who loves us unconditionally. He is our Father who runs to meet us, even after we have rejected and abandoned Him. He is the One always ready to forgive. He is your Father who has your name written on His palms. He is your Father who always walks with you. Who holds you when you stumble, who catches you when you fall, who lifts you when you can’t get up. He is the One, who provides, protects, cares and loves. The One who is always here for us. He is the One who reveals and teaches us His wisdom, who desires us to live blessed lives. There is no need to say, that even the best among earthly fathers, are as far from this ideal, as heavens are from earth. We fail our children. Even in our best days, we are but shadows of what it means to be a father according God’s design. But as soon as we turn to our Father in heavens, there is forgiveness and mercy for all of us. He sends His messengers to deliver the sweetest of messages to all fathers: “I forgive you all your sins. You are forgiven.” Then He sends His Spirit to help all fathers to care for people entrusted to them. For us Christians, our way ahead is clear. God’s wonderful truth and wisdom is entrusted to us. We hold the key that can rebuild our society. It has happened before. It can happen again. We as Christians have a lot to do. It will take generations to restore this lost wisdom. But we have the Triune God on our side. We have this perfect Son, this perfect Husband, and this perfect Father on our side. They are our examples, but even more, – they are also our help and strength. And He is, our true Father in Heaven. And often it is in our weakness, when God’s power is made perfect. Ideas have consequences. Let this truth of our God be made know to all people, through our lives, and through our words. Blessed Fathers’ Day! Amen.